In the late 1800s, the area offshore of Summerland Beach contained hundreds of oil wells and related drilling infrastructure. Today, the coastline area retains the vestiges of that extensive offshore oil production. These are the unfortunate legacy of the rapid and intensive offshore oil development along the coastline that began just before the turn of the twentieth century, primarily at Summerland Beach in Santa Barbara County. Most legacy oil and gas wells were abandoned in the early 1900s when oversight was nonexistent. Virtually no records exist regarding the drilling and abandonment of these wells. Removal, if any, varied from well to well and involved rudimentary procedures that fell well short of current health, safety, and environmental protection requirements. Based on the Commission’s research, there are 200 high priority legacy oil and gas wells (identified as Category 1 wells), that could, depending on their condition, leak oil into the marine environment, negatively impacting swimmers, surfers, recreational users, and marine and coastal wildlife and fish, as well as causing environmental degradation and public health and safety hazards. Many other wells are categorized as medium (Category 2) to low (Category 3) priority wells because more information is available about the integrity and abandonment of these wells or because a responsible party is or may be available to address any leak that may occur. 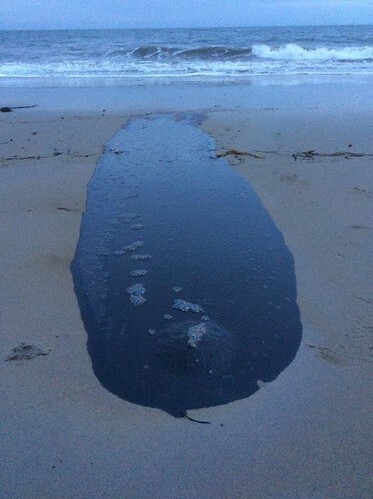 Please use this form to report oil seeps or sheens at Summerland Beach in Santa Barbara County. Email the completed form to Gabriel.Chapa@slc.ca.gov or contact the Santa Barbara field office at 805.685.8502 for information about submitting the form or reporting oil seeps or sheens. The Becker well at Summerland beach was a leaking legacy well that was drilled in the late 1800s, predating the Commission, regulatory agencies, and well record keeping. The improperly abandoned well had a history of leaking oil onto the beach and in the ocean off Summerland Beach. In August 2017, the Commission certified an Environmental Impact Report that allowed us to abandon and remediate the well and other leaking wells off the Santa Barbara and Ventura coastline. In November 2017, staff issued a contract to InterAct to abandon the Becker well. Core samples were taken in mid-December 2017 to establish bedrock and subsurface conditions—a precursor to remediating the well. The Commission is thrilled to report that the Becker well abandonment is complete. InterAct extracted the cofferdam, and on March 2, they loaded and removed the barge. The Becker well remediation is complete. Here are a series of photos showing the oil leakage on Summerland Beach from the Becker well and the progress from when the crane barge arrived through the removal of the cofferdam, and finally, a photo of the Becker well site post project. The Commission, when funding is available, removes coastal hazards along the California coast. Coastal hazards include wood or steel piles or piling, sheet metal pilings, H piles and H beams, well casings, well caissons, railroad irons, cables, angle bars, pipes, pipelines, rip rap, and wood beams and structures. In the mid-1980s, the Commission inventoried coastal hazards and identified over 400 hazards on lands within its jurisdiction, many of which are on state and local beaches and in coastal areas that the public uses. Their presence is inherently at odds with safe beach access for recreation, fishing, surfing, swimming, kite boarding, and other popular public activities. Removing coastal hazards is essential to safe public access.